Please arrange all payments for this event with Tom Koehl at tkoehl2769@comcast.net. Early arrivals to have open visiting among the boats. Attendees on their own for Happy Hour and Dinner in Cocoa (BYOB), which is only a couple of minutes walk from the marina. Coffee and donuts in the Marina Clubhouse, open visitation among the boats in AM and sailing or rafting in the PM. Hosted lunch on the marina grill (Burgers, potato salad, etc.) - we'll be looking for volunteer chefs! Evening powerpoint presentation by Jim & Jeanne Kenaston (Completed a three-year circumnavigation in their W32 "Sabatical"). We are also hoping that Bud will attend and hold a Q&A session. (1) Ice water and soda (pop) will be served with lunch, and beer and wine will be served with the Saturday supper, however other than that bring your own beverages of choice. 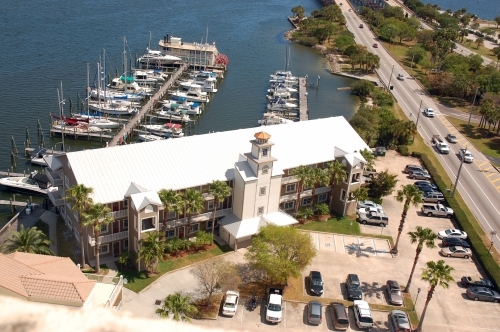 (2) Cocoa Village Marina has set aside about eight slips for attendees. The overnight transient fee of $1.45 per foot applies, and 30 amp service and wifi are provided. The clubhouse has very nice facilities, including showers, TV, kitchen, and washer/dryers.